The SECOND half of the season got underway this PAST weekend in the Major League Baseball, and the TWO teams that play in the BIGGEST market in the league faced each other in the Bronx. The Yankees and the Mets were scheduled to play THREE games this weekend, but the Yankees MOST difficult opponent this season turned its UGLY HEAD once AGAIN. The FINAL game of the Subway series was RAINED OUT, the Yankees now have to make up FOUR games that have been rained out. 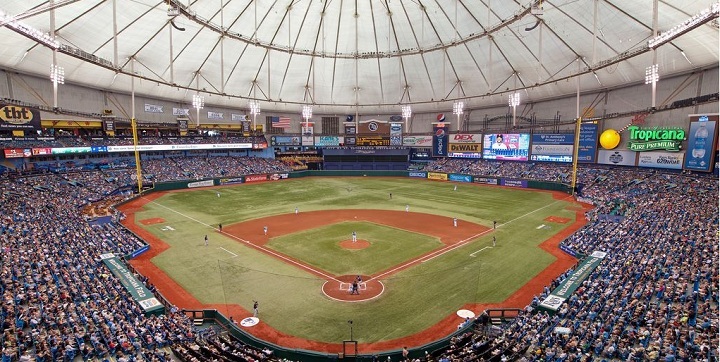 This week, the Yankees travel to Tropicana Field, which has been a HOUSE of HORRORS for the Yankees this season after getting SWEPT in THREE games there last month against the Devil Rays. The next EIGHT games for the Yankees are against TRASH teams, which they have NOT fared well against this season before they take on the Boston Red Sox, who are the BEST team in baseball. Game 1- The Yankees had slated Domingo German to pitch the FIRST game of the Subway Series, German has been TRASH over his last COUPLE of starts so this was an IMPORTANT start for him and he SHAT the bed right away. He gave up THREE runs in the FIRST inning. German was already on THIN waters with his spot in the rotation and the water BROKE on Friday Night. He was sent DOWN to the Minors following the game on Friday. The Yankees do NOT have a consistent FIFTH starter in the rotation after the DEMOTION of German so it shows how BAD he has been lately. Noah Syndergaard, who is the WORST human on the planet, was scheduled to pitch the LAST game of the Subway Series in Queens last month, but he was too much of a COWARD so he went on the DL and came back on Friday. He was NOT great, but the Yankees left FOURTEEN men on base during the game and helped give Syndergaard one of the BIGGEST wins of his career. The Yankee offense made it close LATE in the game and pulled to within ONE run in the EIGHTH inning, but they could NOT get that BIG hit and LOST the game, 7-5. At the time, they had falled FIVE and a HALF games OUT of first place in the AL East, which is #NOTGreat. Game 2- After a DISAPPOINTING start to the second half of the season, the Yankees HAD to win the next TWO games against the Mets to save face over their Cross Town RIVALS. Sonny Gray has been the WORST player on the Yankees at times this season, but he was GREAT in his LAST start prior to the Subway Series, but it came against the WORST team in baseball, the Baltimore Orioles. This time around he was taking on the Mets, who are the WORST team in the National League. The weather was NOT Sonny on Saturday, but Gray was GREAT once AGAIN and got Back to Back WINS for the FIRST time as a Yankee. Despite the fact that his last TWO starts came against the WORST teams in each league, this stretch is going to HELP Gray going down the stretch this season. The Mets had jumped out to an EARLY 1-0 lead and the Yankees had LEFT some men On Base EARLY on, so the result was going to be the same as Friday night early on until Didi Gregorius showed why the Yankees made the RIGHT move by not trading for Manny Machado to REPLACE Didi. It’s an RBI TRIPLE for Sir Didi! The Yankees ended up scoring FOUR runs in the FOURTH and were coasting with a 7-3 lead going into the NINTH with All Star closer, Aroldis Chapman coming in the game. Chapman had been dealing with Knee Tendinitis, so he has NOT pitched much lately due to the All Star break and those JITTERS were showing on Saturday. He could NOT throw a strike and ended up walking in TWO runs with the Bases Loaded. Chapman was going to BLOW this game if he was kept in the game, so Manager Aaron Boone brought in Chasen Shreve into the game. Shreve has a LONG history of BLOWING big leads for the Yankees, so fans were NOT excited to see him, but he had OTHER plans. The Mets scored ANOTHER run but it was on a DOUBLE play which cleared the bases and Shreve got the LAST out to give the Yankees a 6-5 WIN. Game 3- RAINED OUT: Will be made up on August 13th. There were NOT many glaring observations from this past weekend as we only saw TWO games. The Yankee offense HEAVILY relies on Home Runs so they are going to have some OFF nights like they did on Friday Night. The KEY for the Yankee offense is make sure that the WHOLE team does NOT have an OFF night in the same game. Gary Sanchez came back from the DL on Friday Night after a MONTH off and Gleyber Torres is going to RETURN to the Yankees later this week. Sanchie and Gleyber SHOULD make this offense BETTER going into the last TWO months of the Regular Season. As I said EARLIER, the Yankees sent down Domingo German and are now looking for SOMEONE to fill that HOLE in the rotation. They have lined up Luis Cessa to pitch in place of German in the NEXT start, Cessa had a GOOD start the last time he made a SPOT start but he is NOT a LONG term option for the Yankees and they NEED to fill that HOLE. The Yankees can FIX the hole INTERNALLY, by calling up their one of their GREAT pitching prospects like Justus Sheffield or Josh Rogers, OR go OUTSIDE the organization and TRADE for someone. The trade deadline is a WEEK from Tuesday, so the Yankees HAVE to move QUICKLY if they want a pitcher OUTSIDE of the organization to be the FIFTH starter going down the stretch as they look to WIN their TWENTY EIGHTH World Series championship. I do NOT think that there is a good pitching option available via a trade, so they should FIX this hole INTERNALLY. The next EIGHT games for the Yankees are against INFERIOR opponents, which has been a WEAKNESS for them this season. They are the BEST team in baseball against FIRST place teams but have the WORST record in baseball against LAST place teams. The Devil Rays are in THIRD place in the AL East but they are FOURTEEN games behind the Yankees, so I would say they are inferior to the Yankees.